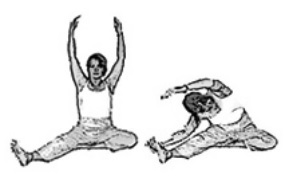 Makko-Ho stretches are a series of meridian opening movements, which is part of the shiatsu system of health. They are useful not just because they stretch each pair of meridians, but because they can monitor the state of the meridian’s health by the ease and flexibility with which you can get into each position. They may appear to be similar to some yoga postures, but they differ in the intent and the way we work into them. With Makko Ho we try to remain in an state of relaxation, as we breath in, as we slowly move into the stretch on the exhale. While remaining in the stretch, try to remain relaxed through 3 deep breaths. The Makko Ho exercises are used as a self healing technique by allowing the practitioner to both sedate and tonify the meridians through specific stretches to improve the flow of Qi. There is a stretch for each pair of meridians and are based on the theories of Traditional Chinese Medicine. Often it is said that they should be done in the sequence shown (i.e. Metal, Earth, Primary Fire, Water, Secondary Fire, and Wood). Begin the Makko Ho exercises by grounding yourself through relaxed, regulated breathing, while you focus on centering your energy. It is important that you settle into the stretches on the exhalation and that nothing is forced. The emphasis is not so much on the physical stretch but on opening up and moving any stagnant energy in the body. Remember to focus on your breathing and try to note any changes going on within you during each stretch – this includes physical, emotional, and consciousness (Body, Mind, Spirit). To stretch these meridians, stand with your feet shoulder width apart, with your knees relaxed and unlocked. Link your thumbs together behind your back. As you exhale, raise your arms up behind you and, keeping your legs straight, allow your trunk to flex forward. 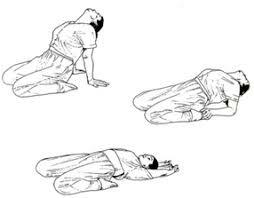 Hold this position on inhalation, and then settle further into the stretch on exhalation (for three respirations). Hold this position before slowly rising to the original position. To stretch these meridians, sit kneeling between your heels and, if you can do the stretch without straining your knees or the lower back, lie back flat on the floor with your arms outstretched on the floor above your head. Do not attempt this stretch if you have problems with your knees or lower back. You can go partly into the stretch by supporting your upper body with your arms and leaning gently back and, when in this position, thrust your pelvis forward. PRIMARY FIRE Primary Fire – Heart/Small Intestine. To stretch these meridians, sit with the soles of the feet are against each other and with your feet pulled close. Relax your legs to allow your knees to lower. Clasp your feet with both hands and, with your back held straight, bend forward from the pelvis as you exhale. Hold this position on inhalation, and then settle further into the stretch on exhalation (for three respirations). Hold this position before slowly returning to the original sitting position. To stretch these meridians, sit on the floor with your back held straight and your legs straightened out in front of you. Raise your arms above your head, and as you exhale, bend forward from the hips, with your knees straight. Hold this position on inhalation, and then settle further into the stretch on exhalation (for three respirations). Hold this position before slowly returning to the original sitting position. SECONDARY FIRE Secondary Fire – Heart Governor/Triple Heater. To stretch these meridians, sit with your legs crossed (if possible, in the lotus position or the half-lotus). Cross your arms so that they are opposite of your legs, (i.e. If your right leg is on top, the left hand is on top) and hold on to your knees. Bend forward as you exhale. Hold this position on inhalation, and then settle further into the stretch on exhalation (for three respirations). Hold this position before slowly returning to the original sitting position. To stretch these meridians, sit up straight with one leg outstretched, flat on the floor, and with the foot upright. The other leg is tucked into the body. 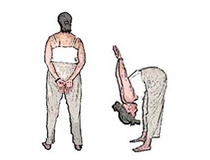 Bring your hands above the head with the palms facing each other and, on exhalation, lean sideways over the outstretched leg (keeping both buttocks on the floor). Hold this position on inhalation, and then settle further into the stretch on exhalation (for three respirations). Hold this position before slowly returning to the original sitting position. Repeat on the other side.